It threatened to be a wild night. All day banks of sea-fog had come and gone, sweeping on shore with the south-east wind, which is so fatal at Cruden Bay, and indeed all along the coast of Aberdeenshire, and losing themselves in the breezy expanses of the high uplands beyond. As yet the wind only came in puffs, followed by intervals of ominous calm; but the barometer had been falling for days, and the sky had on the previous night been streaked with great “mare’s-tails” running in the direction of the dangerous wind. Up to early morning the wind had been south-westerly, but had then “backed” to south-east; and the sudden change, no less than the backing, was ominous indeed. From the waste of sea came a ceaseless muffled roar, which seemed loudest and most full of dangerous import when it came through the mystery of the driving fog. Whenever the fog-belts would lift or disperse, or disappear inland before the gusts of wind, the sea would look as though swept with growing anger; for though there were neither big waves as during a storm, nor a great swell as after one, all the surface of the water as far as the eye could reach was covered with little waves tipped with white. Closer together grew these waves as the day wore on, the angrier ever the curl of the white water where they broke. In the North Sea it does not take long for the waves to rise; and all along the eastern edge of Buchan it was taken for granted that there would be wild work on the coast before the night was over. In the little look-out house on the top of the cliff over the tiny harbour of Port Erroll the coastguard on duty was pacing rapidly to and fro. Every now and again he would pause, and lifting a field-glass from the desk, sweep the horizon from Girdleness at the south of Aberdeen, when the lifting of the mist would let him see beyond the Scaurs, away to the north, where the high cranes of the Blackman quarries at Murdoch Head seemed to cleave the sky like gigantic gallows-trees. William Barrow, popularly known as Sailor Willy, was a very young man to be a chief boatman in the preventive service, albeit that his station was one of the smallest on the coast. He had been allowed, as a reward for saving the life of his lieutenant, to join the coast service, and had been promoted to chief boatman as a further reward for a clever capture of smugglers, wherein he had shown not only great bravery, but much ability and power of rapid organisation. The Aberdeen coast is an important one in the way of guarding on account of the vast number of fishing-smacks which, during the season, work from Peterhead up and down the coast, and away on the North Sea right to the shores of Germany and Holland. This vast coming and going affords endless opportunities for smuggling; and, despite of all vigilance, a considerable amount of “stuff” finds its way to the consumers without the formality of the Custom House. The fish traffic is a quick traffic, and its returns come all at once, so that a truly enormous staff would be requisite to examine adequately the thousand fish-smacks which use the harbour of Peterhead, and on Sundays pack its basins with a solid mass of boats. The coast-line for some forty miles south is favourable for this illicit traffic. The gneiss and granite formations broken up by every convulsion of nature, and worn by the strain and toil of ages into every conceivable form of rocky beauty, offers an endless variety of narrow creeks and bays where the daring, to whom the rocks and the currents and the tides are known, may find secret entrance and speedy exit for their craft. This season the smuggling had been chiefly of an overt kind – that is, the goods had been brought into the harbour amongst the fish and nets, and had been taken through the streets under the eyes of the unsuspecting Customs officers. Some of these takes were so large, that the authorities had made up their minds that there must be a great amount of smuggling going on. The secret agents in the German, Dutch, Flemish, and French ports were asked to make extra exertions in discovering the amount of the illicit trade, and their later reports were of an almost alarming nature. They said that really vast amounts of tobacco, brandy, rum, silks, laces, and all sorts of excisable commodities were being secretly shipped in the British fishing-fleet; and as only a very small proportion of this was discovered, it was manifest that smuggling to a large extent was once more to the fore. Accordingly precautions were doubled all along the east coast frequented by the fishing-fleets. Not only were the coastguards warned of the danger and cautioned against devices which might keep them from their work at critical times, but they were apprised of every new shipment as reported from abroad. Furthermore, the detectives of the service were sent about to parts where the men were suspected of laxity-or worse. 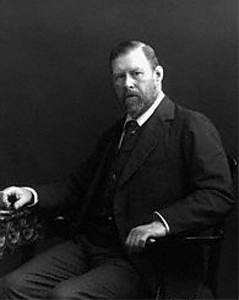 “Recollections of the Late W. G. Wills” was a nonfiction article by Bram Stoker. It was first published in the December 19, 1891 issue of The Graphic: An Illustrated Weekly Newspaper, London. It first appeared in book form on December 24, 2012 in The Forgotten Writings of Bram Stoker edited by John Edgar Browning. The lonely Shadow Builder watches ever in his lonely abode. The walls are of cloud, and round and through them, changing ever as they come, pass the dim shades of all the things that have been. This endless, shadowy, wheeling, moving circle is called The PROCESSION OF THE DEAD PAST. In it everything is just as it has been in the great world. There is no change in any part; for each moment, as it passes, sends its shade into this dim Procession. Here there are moving people and events – cares – thoughts – follies – crimes – joys – sorrows – places – scenes – hopes and fears, and all that make the sum of life with all its lights and shadows. Every picture in nature where shadow dwells – and that is every one – has here its dim phantom. Here are all pictures that are most fair and most sad to see – the passing gloom over a sunny cornfield when with the breeze comes the dark sway of the full ears as they bend and rise; the ripple on the glassy surface of a summer sea; the dark expanse that lies beyond and without the broad track of moonlight on the water; the lacework of glare and gloom that flickers over the road as one passes in autumn when the moonlight is falling through the naked branches of overhanging trees; the cool, restful shade under the thick trees in summer time when the sun is flaming down on the haymaker at work; the dark clouds that flit across the moon, hiding her light, which leaps out again hollowly and coldly; the gloom of violet and black that rises on the horizon when rain is near in summer time; the dark recesses and gloomy caverns where the waterfall hurls itself shrieking into the pool below, – all these shadow pictures, and a thousand others that come by night and day, circle in the Procession among the things that have been. Here, too, every act that any human being does, every thought – good and bad – every wish, every hope – everything that is secret – is pictured, and becomes a lasting record which cannot be blotted out; for at any time the Shadow Builder may summon with his special hand any one – sleeping or waking – to behold what is pictured of the Dead Past, in the dim, mysterious distance which encompasses his lonely abode. In this ever-moving Procession of the Dead Past there is but one place where the circling phantoms are not, and where the cloudy walls are lost. There is here a great blackness, dense and deep, and full of gloom, and behind which lies the great real world without. This blackness is called THE GATE OF DREAD. The Procession afar off takes from it its course, and when passing on its way it circles again towards the darkness, the shadowy phantoms melt again into the mysterious gloom. Sometimes the Shadow Builder passes through the vapoury walls of his abode and mingles in the ranks of the Procession; and sometimes a figure summoned by the wave of his spectral hand, with silent footfall stalks out of the mist and pauses beside him. Sometimes from a sleeping body the Shadow Builder summons a dreaming soul; then for a time the quick and the dead stand face to face, and men call it a dream of the Past. When this happens, friend meets friend or foe meets foe; and over the soul of the dreamer comes a happy memory long vanished, or the troubled agony of remorse. But no spectre passes through the misty wall, save to the Shadow Builder alone; and no human being – even in a dream – can enter the dimness where the Procession moves along. So lives the lonely Shadow Builder amid his gloom; and his habitation is peopled by a spectral past. His only people are of the past; for though he creates shadows they dwell not with him. His children go out at once to their homes in the big world, and he knows them no more till, in the fulness of time, they join the Precession of the Dead Past, and reach, in turn, the misty walls of his home. For the Shadow Builder there is not night nor day, nor season of the year; but for ever round his lonely dwelling passes the silent Procession of the Dead Past. Sometimes he sits and muses with eyes fixed and staring, and seeing nothing; and then out at sea there is a cloudless calm or the black gloom of night. Towards the far north or south for long months together he never looks, and then the stillness of the arctic night reigns alone. When the dreamy eyes again become conscious, the hard silence softens into the sounds of life and light. Sometimes, with set frown on his face and a hard look in the eyes, which flash and gleam dark lightnings, the Shadow Builder sways resolute to his task, and round the world the shadows troop thick and fast. Over the sea sweeps the blackness of the tempest; the dim lights flicker in the cots away upon the lonely moors; and even in the palaces of kings dark shadows pass and fly and glide over all things – yea, through the hearts of the kings themselves – for the Shadow Builder is then dread to look upon. Time goes on in the Country Under the Sunset much as it does here. Many years passed away; and they wrought much change. And now we find a time when the people that lived in good King Mago’s time would hardly have known their beautiful Land if they had seen it again. It had sadly changed indeed. No longer was there the same love or the same reverence towards the king-no longer was there perfect peace. People had become more selfish and more greedy, and had tried to grasp all they could for themselves. There were some very rich and there were many poor. Most of the beautiful gardens were laid waste. Houses had grown up close round the palace; and in some of these dwelt many persons who could only afford to pay for part of a house. So is it ever with us also, that when we hear the wind sighing and moaning and sobbing round our houses in the lonely nights, we do not think our Angels may be sorrowing for our misdeeds, but only that there is a storm coming. The Angels wept evermore, and they felt the sorrow of dumbness-for though they could speak, those they spoke to would not hear. The name of this good old man was Knoal, and he lived in a house built of great blocks of stone, in the middle of a wild place far from the city. In the city there were many great old houses, storey upon storey high; and in these houses lived many poor people. The higher you went up the great steep stairs the poorer were the people that lived there, so that in the garrets were some so poor that when the morning came they did not know whether they should have anything to eat the whole long day. This was very, very sad, and gentle children would have wept if they had seen their pain. In one of these garrets there lived all alone a little maiden called Zaya. She was an orphan, for her father had died many years before, and her poor mother, who had toiled long and wearily for her dear little daughter-her only child-had died also not long since. Poor little Zaya had wept so bitterly when she saw her dear mother lying dead, and she had been so sad and sorry for a long time, that she quite forgot that she had no means of living. However, the poor people who lived in the house had given her part of their own food, so that she did not starve. Then after awhile she had tried to work for herself and earn her own living. Her mother had taught her to make flowers out of paper; so that she made a lot of flowers, and when she had a full basket she took them into the street and sold them. She made flowers of many kinds, roses and lilies, and violets, and snowdrops, and primroses, and mignonette, and many beautiful sweet flowers that only grow in the Country Under the Sunset. Some of them she could make without any pattern, but others she could not, so when she wanted a pattern she took her basket of paper and scissors, and paste, and brushes, and all the things she used, and went into the garden which a kind lady owned, where there grew many beautiful flowers. There she sat down and worked away, looking at the flowers she wanted. Sometimes she was very sad, and her tears fell thick and fast as she thought of her dear dead mother. Often she seemed to feel that her mother was looking down at her, and to see her tender smile in the sunshine on the water; then her heart was glad, and she sang so sweetly that the birds came around her and stopped their own singing to listen to her. So a nickname was applied to her, and naughty boys called it after her in the street, and the nickname was “Big Bird”. But Zaya did not mind the name; and although often naughty boys said it to her, meaning to cause her pain, she did not dislike it, but the contrary, for she so gloried in the love and trust of her little sweet-voiced pets that she wished to be thought like them. Indeed it would be well for some naughty little boys and girls if they were as good and harmless as the little birds that work all day long for their helpless baby birds, building nests and bringing food, and sitting so patiently hatching their little speckled eggs. One evening Zaya sat alone in her garret very sad and lonely. It was a lovely summer’s evening, and she sat in the window looking out over the city. She could see over the many streets towards the great cathedral whose spire towered aloft into the sky higher by far even than the great tower of the king’s palace. There was hardly a breath of wind, and the smoke went up straight from the chimneys, getting further and fainter till it was lost altogether. Zaya was very sad. For the first time for many days her birds were all away from her at once, and she did not know where they had gone. It seemed to her as if they had deserted her, and she was so lonely, poor little maid, that she wept bitter tears. She was thinking of the story which long ago her dead mother had told her, how Prince Zaphir had slain the Giant, and she wondered what the prince was like, and thought how happy the people must have been when Zaphir and Bluebell were king and queen. Then she wondered if there were any hungry children in those good days, and if, indeed, as the people said, there were no more Giants. So she went on with her work before the open window. Presently she looked up from her work and gazed across the city. There she saw a terrible thing-something so terrible that she gave a low cry of fear and wonder, and leaned out of the window, shading her eyes with her hands to see more clearly. In the sky beyond the city she saw a vast shadowy Form with its arms raised. It was shrouded in a great misty robe that covered it, fading away into air so that she could only see the face and the grim, spectral hands.